The City took a stab at détente between kitesurfers on Miami Beach and beachgoers who say they create a safety hazard in the 24-25th Street and Collins Avenue area. While the tension in the room was palpable at times during a public meeting this morning, both sides seemed willing to find a way to live together. The issue came to a head at the end of October when a kitesurfer bumped the back of two beach chairs. While minor, the incident escalated complaints from residents about the kitesurfing activity in the area and led the City to put a new lifeguard station at 26th Street. As a result of rules about line of sight for lifeguards, the kitesurfers had to move further north to launch. Commissioner Kristen Rosen Gonzalez raised the issue of a potential ban. Today, residents, kitesurfers, and beach vendors gathered to brainstorm ideas for resolving the conflict in a way that provides access for those participating in the sport and safety for beachgoers. 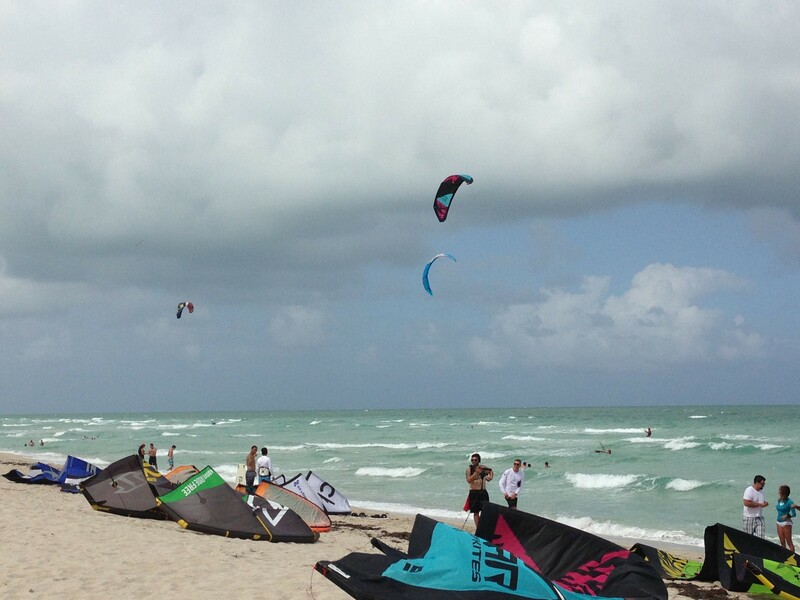 The fast growth of the sport was underscored by Roman Wunderlich, President of the Miami Beach Kitesurfing Foundation. Started in the 1990s as a combination of wakeboarding, sailing, and surfing, the sport had 250,000 participants in 2006. By 2016, he said, there were 2.5 million kiteboarders. The Miami area is tied with New York City for having the second largest kite population. San Francisco has the largest. But, Wunderlich said, New York has 68 kite launch areas and San Francisco 48, while Miami has three. One of those is in a parking lot which damages the kites, he said, so it doesn’t get much use. The other two are at 76th Street and Crandon Park. The Foundation has suggested rules for safe kiteboarding on Miami Beach: Stay 200 feet from shore, 50 feet from swimmers. Never fly a kite over the beach – it is for launching and landing only. And they ask that kiteboarding access be permitted near lifeguard towers for kitesurfer safety. He reminded the group, “We are all taxpaying citizens. We train,” but he said, “We also need your help.” He said there had been only a “handful of accidents over the past year” involving a small fraction of practicing kiteboarders. In fact, he pointed out, “One local kiteboarder recently saved three swimmers” who were in distress. TKS co-owner Juan Pavan suggested separate locations for commercial operations, training, and recreation. Blittner said it is easy to separate out beginners from those who are proficient as the sport recognizes certifications from levels 1-7. Level 3 is considered “self-sufficient”. Lipcon noted she kiteboards in Mid-Beach where she lives and wants to continue to do that. Eventually, a collective list of suggested locations emerged from the attendees who moved between two breakout groups on location and rules. The 24-25th Street area that raised the most concerns was suggested for the more experienced kitesurfers, those at level 3 and above. On the issue of rules, perhaps the biggest concern was who would enforce them: lifeguards, park rangers, marine patrol, police officers? Vincent Canosa, Miami Beach Ocean Rescue Chief said, “We don’t have the time to leave our towers. We need somebody else to handle that.” He pointed out that most rescues occur on the days that are best for kitesurfing. Ideas for managing kitesurfers included having color-coded streamers to hang from kites that identify a surfer’s proficiency level and a registration process to prove a kiteboarder is certified at level 3. A concern repeated several times was whether the City had enough resources to enforce a new set of rules. Spiers asked, “What about people showing up on the beach from out of town? Who’s going to police them?” The ideas discussed for registration would require the City to “set up a whole infrastructure to monitor and enforce. It’s not practical. I think it’s more important to focus on unsafe people. The resources need to be there,” Spiers said. Pavan of TKS pointed out getting rid of” illegal concessions can change a lot. Less people will go there” to 25th Street, he said. The group, which was scheduled to meet for two hours, spent an extra half hour discussing ideas and then lingered to talk with each other after. At least for today, détente may have been achieved. But, as they say, the devil is in the details. Now it is up to City staff and leadership to craft the policy to make it real. Below: Kitesurfers at a launch space.